2015 starts with RED. Thanks to Loreal. Are you also mesmerized by REDS these days. Oh. Thats so normal. Everyone is. You also want to own that perfect red for you. So possible with the launch of Loreal Color Riche Star Red Lipstick Collection. This range has 7 reds. So there is at least one for everyone. The 7 lipsticks in this Star Red Collection are signed by 7 celebrities. Pure Garnet – by Sonam Kapoor. Pure Rouge – by Frieda Pinto. L’Oréal Paris starts the new year painting 2015 RED! Presenting the the Color Riche Collection Star range. A rouge for every woman. Discover a shade of red that is as unique as you are! The range includes 7 exquisite matte shades that are chosen by 7 iconic L’Oréal Paris ambassadors. The Collection is created with a revolutionary and innovative formula that delivers bold, luscious color that lasts for a full 6 hours, making it the ultimate beauty indulgence. The range is enriched with new Light Illum complex that delivers a rich matte effect. The Velvet Fusion capsules and Ultra Gliding Shine Oils provide smooth and silky application. Pure pigments deliver intense color and Jojoba oil gives perfect hydration up to 4 hours. The bullet case is fine quality and closes perfectly not to open in purse or while travelling. The case has a colored shade indicator in the front which lets you get a feel of the color. The lipstick is pure matt but is moisturising enough. You don’t need to take any special care of lips before application. It doesn’t dry them out any further but if you lips are already dry and flaky, then exfoliate before applying to get good results. The lipstick feathers a bit so don’t forget the lip liner application before this and I prefer touching this up with a lip liner afterwards too to seal it :). The lipstick is well pigmented. You can get the color in a single swipe but for a more enhanced rich color, go for 2-3 swipes and you have that perfect shade on your lips. T stays for a good time, say around 5-6 hours and even after that, it goes to a nice stain, no patches. If you want to check out whole range then go to Loreal website. Color indicator to identify shade on packaging. Matt finish but moisturising enough. Stay for a good 5 hours and only fade after that leaving an even stain. Very easy application, no tugging or pulling. Almost fragrance free, very mild. I would definitely recommend this range to the red lovers. Try this collection for the matt finish alongwith the moisturization it delivers. An excellent quality and a classy packaging, it is a lipstick lover’s delight. A red for everyone, you can choose your choice. Try the range and pick your favourite 🙂. Very pretty shade ! looks nice on u ! That is a lovely shade on you! This is a nice but costly range… 🙂 lovely review charu.. 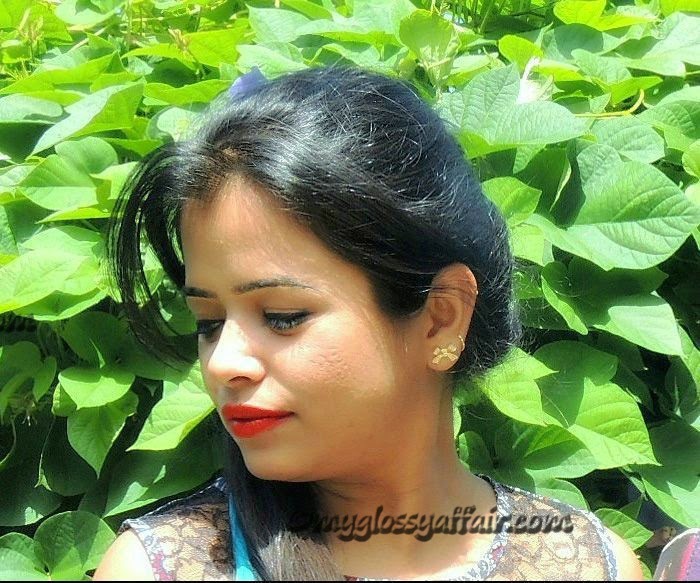 This is my favorite shade from the latest range of loreal lipsticks………..
Love this color and you look so amazing! This is such a gorgeous shade and looks great on! I also really like the packaging. I'm happy that the formula is still quite moisturizing!